Rogers Hornsby's legendary quote almost always dances through my head around this time of year, as I barricade myself inside from treacherous cold fronts and count down the days to those four glorious words: Pitchers and catchers report. There are always elements of mystery and excitement at play as the off-season winds down, but right now it's all magnified. First, because the team's biggest off-season splash is almost surely yet to come. And second, because the Twins are uniquely positioned to make a run at a division title and more in 2018. The window is wide open, due in large part to very fortuitous (and temporary) outside circumstances. Mariners GM Jerry DiPoto had a pretty wild quote last week. He said that in the game right now, "You could argue there is more competition to get the No. 1 pick in the draft than to win the World Series." And well, there's a lot of truth in that statement, which surely makes MLB Commissioner Rob Manfred bristle. Agent Scott Boras lamented earlier this week that a "non-competitive cancer" is "ruining the fabric of the sport." Dramatic and biased? Yes. But that doesn't mean he's completely off base. The "loser bug" is certainly present in the AL Central, where three teams are making virtually no effort to contend. Ron Gardenhire's Tigers are coming off a season in which they finished last and traded away their best pitcher and hitter. Barring remarkable turnarounds from Miguel Cabrera and Victor Martinez, along with some major rotation breakthroughs, Detroit appears destined for 90-plus losses. It's tough to expect much more from the Royals, who earlier this week dumped slugger Brandon Moss and standout lefty reliever Ryan Buchter in exchange for Jesse Hahn, who sadly has a decent shot at a rotation spot. Earlier in the same day, they'd settled for another year of Alcides Escobar at short, agreeing on a one-year pact. Kansas City may still have another big move or two left in the tank, but seems resigned to its fate as an also-ran in 2018. Keith Law recently ranked the organization's farm system as the worst in the AL while Baseball America pegged it second-worst in baseball. And of course, the White Sox are only one year removed from an epic teardown. They've got plenty of young talent, and could surprise by surpassing low expectations, but Chicago is in no way a legitimate threat in the division. Cleveland remains the de facto favorite, with good reason, but even the Indians haven't done much to separate themselves this off-season. Not yet, anyway. How often is it that three-fifths of your division is simultaneously rebuilding? Not very. And in this case it surely won't last long. The White Sox are already bringing along some of the key youngsters netted in their fire sale. You can't count on KC or Detroit staying down and out for too long. But right now, you can make a case they are the three worst teams in the American League on paper. This puts the Twins in a seriously advantageous position, not only removing barriers in their quest to take the AL Central, but also – potentially – padding their win total for a run at a wild-card spot. Derek Falvey and Thad Levine talk often about looking at the big picture. They won't sacrifice the long-term vision for short-term gains. Many front offices are of the same mind at this time, obviously. But the big picture is this: the division is as ripe for the taking as it has been in years. The league is in a strange state of flux. And the Twins have a coalescing young core that improved by 26 wins last year. I highly doubt the new front office expected to find itself in this position so quickly, but the time to strike is now. Windows don't stay open forever. When you glorify championships, this is what you get. Wha? When have championships not been glorified? Why wouldn’t they be? No question the Twins should be able to take advantage of a weaker division to pad their bid for the WC. That's a talking point that often goes unmentioned. I'm not sure how ripe the division is for the taking this season though. You're right, Cleveland hasn't done much this offseason. Swapping Alonso for Santana might be a slight downgrade, and losing Shaw didn't help either but IMO the only thing keeping the Indians from coasting to the Central title is health. If they're healthy that pitching staff is one of the best in baseball. Add to that a good bullpen and tons of positional talent and it's hard to see MN taking the division from them. The window is absolutely open this year. But the team needs reinforcements. Houston stared at the window for two seasons (2015, 2016) before coming to terms with the fact that it is not enough to count on your young corps. It has to be augmented with veteran leaders. They need to sign a front-end starter and a veteran bat, and then probably need to double down on those same efforts at the trade deadline. I would go so far as to say that, in order for the Twins to be playing in the World Series this year, it will take a roster that has on it 5-7 players who right now are not even in the organization. Wonderful article. As Elvis sang: "It's now or never"!Well maybe not never, but it surely seems like a long time since 1991. The window is certainly open. I'd argue that if the White Sox had ripped it down to the studs, they'd be in the perfect position to compete with a young veteran club that includes the rare and perhaps mythical True Ace. The Royals took their shot and it paid off. The Tigers swung for the fences and came short. Good for them. The tanking thing (at least in its current iteration) will run its course, but in the meantime, the Twins should be bold and take advantage in a buyers market. Why is this subject so important? Winning the division? It is certainly nice to see the progress lately after the four very bad years but winning the division in perhaps (says the article) the weakest division is not a definition of a great team is it? A deep playoff run, ie the championship series should be the minimum goal in my estimation. Again, I am not meaning to downplay the progress this team has made lately and I love the youth, we have the formations of a very strong roster for some years to come. I just believe expectations should be higher. With the current pitching staff I don't think the Window is open.The FO would need to spend about 30 - 40 MM more on 2 FA pitchers to have an "on paper" shot at the title this year.Also the White Sox have a stacked minor league system.If their prospects come on they could compete this year. I identify with this. There are two seasons to every year: baseball season and waiting for baseball season. "This puts the Twins in a seriously advantageous position"
This "advantageous position" made the Twins looks like a great team when they really weren't in the 2000's.I'm sorry but doing well in the regular season and getting swept in the playoffs doesn't do anything for me.It's easy to have a good record when 3/5 of your division is not interested in competing.That is 35% of your schedule is against teams that are battling for the rights to draft Nick Lodolo or Bobby Witt, Jr instead of the rights to hoist the World Series trophy. Don't get me wrong...I am excited to see what the Twins are going to do with the talent they have over the next few years.This squad definitely has more raw talent and a higher ceiling than most of the 2000 teams did.Nonetheless, I won't be impressed until I see some postseason success. They still need pitching. We should be careful about where we think the Twins are -- last year was a down year for the AL. Yes they are in a good position but the front office has work to do. They probably won't finish where they did next year without a little more pitching help. This "advantageous position" made the Twins looks like a great team when they really weren't in the 2000's. I'm sorry but doing well in the regular season and getting swept in the playoffs doesn't do anything for me. It's easy to have a good record when 3/5 of your division is not interested in competing. That is 35% of your schedule is against teams that are battling for the rights to draft Nick Lodolo or Bobby Witt, Jr instead of the rights to hoist the World Series trophy. Don't get me wrong...I am excited to see what the Twins are going to do with the talent they have over the next few years. This squad definitely has more raw talent and a higher ceiling than most of the 2000 teams did. Nonetheless, I won't be impressed until I see some postseason success. Why even follow the team? Click on for the playoffs. There are 162 regular season games. It's a lot more fun when they win. I'm frustrated with playoff losses. But I've always said that summer itself is a lot more fun when the Twins are relevant. I admit I like what they've done with the bullpen and I think we can expect better seasons from Buxton, Sano, Polanco and Kepler so our offense should be even better. We really aren't that far away. Darvish might be enough to put us over the top but until we address starting pitching, we really won't know where we stand compared to Cleveland. I guess I'd make the distinction between expectation and aspiration. If Falvey gets us a #2 type starter, and if Santana and Berrios give us a bit better that #3 production, and if the back end of the rotation...you get the point...if things come together, then this team can be EXPECTED to compete for the wild card again, even have a shot at the division if Cleveland has a rash of injuries and we don't. Of course Falvey and gang aspire to more, as do fans. I don't think anyone is well-advised to expect that until we see a few more exciting additions and start to see peak performances from the core. Fortunately, that other window, the window that says the organization has the capacity to make the required moves, has also opened. They have the trifecta of cash, a decent talent pipeline, and the start of some surplus of truly valuable assets that can be traded for assets of like value in areas of deficiency. We'll just have to see if Falvine is up to the challenge. Right now, there's good reason most of our discussions still center on the wild card and the division title. When using a deep playoff run, not just a one and done second WC as a bench mark, I think that window is open, but not as far as I had thought it would be a few years ago. The failure of so many of the high velocity BP arms to produce, the continuing lack of a legitimate #1 starter, and a fairly mediocre level of defense in the IF makes this a far more difficult project than I had anticipated. Spring training will flesh out the roster issues somewhat but it seems the SP issue will go unresolved, some due to options, and some due to indecisiveness. And the Sano issue could be an all season problem for any of several reasons. If the division is as weak as it seems we may pad our win total to allow a second WC appearance. Yawn. ​Thank goodness for TD - it really helps with winter enjoyment. The only thing I have to add Is that living up north in a State Forest I still do not have enough wood for the stove to keep the window open! To me, it goes without saying that summers are more fun when they win.Obviously, watching a winning team (in any sport you enjoy) is fun.Heck, I love baseball.I think it's fun watching baseball. Period.But, I will be expecting the Twins to win 90+ games this year if not even 95+.Now if they go and win 100+ I will probably be more optimistic about their chances in the postseason.But when other teams are putting up the same or more wins in a season and playing better competition...then how was our schedule "advantageous"? This window is the most exciting IMO. We've been conditioned to say trade him for prospects, and call up the kids because they're not competitive over the last 6 years. The window for making competitive moves couldn't happen at a better time. 3 AL Central teams are tanking. And frankly half of baseball is more interested in the 1st overall pick than a wild card berth. I agree with all of this. One thing we can't count on however is Sano, Polanco, Buxton, and Kepler staying as healthy as they did last season. It's not mentioned enough how fortunate the team was that every position player stayed healthy throughout the season. Buxton missed a couple of weeks at most, and Sano missed the last month and change. That's it. So I agree they'll all produce better numbers, it just may not look like it if they're playing less games. That's a fair point. Health for every team is a big issue. 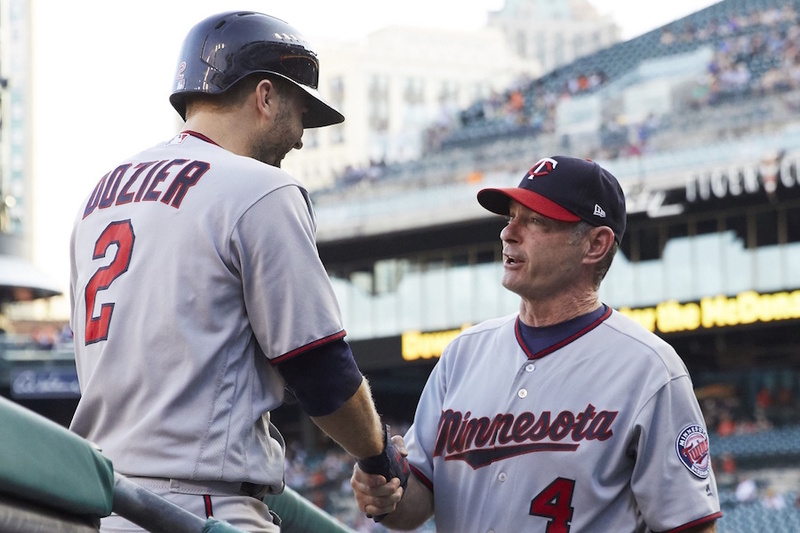 I'm not sure if Molitor actually deserves credit for his use of days off for the players, if the Twins were just "lucky" last year of if the young guys (and Dozier) are just hearty but injuries are always a big concern that hasn't really affected us too much over the last few years. We have some depth (I think the Rochester rotation will be May, Gonsalves, Slegers and Romero) and Granite and Gordon could be the first position players up but if Buxton misses half a season, they really can't make that up. To me, it goes without saying that summers are more fun when they win. Obviously, watching a winning team (in any sport you enjoy) is fun. Heck, I love baseball. I think it's fun watching baseball. Period. But, I will be expecting the Twins to win 90+ games this year if not even 95+. Now if they go and win 100+ I will probably be more optimistic about their chances in the postseason. But when other teams are putting up the same or more wins in a season and playing better competition...then how was our schedule "advantageous"? Margin of error. Buxton could go down for a month. Santana for 4 starts and we cam still finish first or second in the division. Rougher to do so in the east. That's right. Deeper playoff runs would have been nice, but the 00s were a great run for this team even without them. Agreed.That still doesn't better prepare us for the postseason where winning really matters. I agree with the article but would also like to point out another detail. It is important to create a winning culture in the regular season so that when the playoffs come, the players know what to expect from their own performance. Winning is a mentality that provides confidence. "I know that when I perform at "x" level, I am capable of winning." That mentality is the important and can only be built during the regular season.